Topic: Business Research: the why, what and how. Language: This workshop is conducted in English. Cost: THB 7,500 net for members and THB 8,500 for non-members. This fee is inclusive of VAT, course materials, buffet lunch and coffee break. Cancellation policy: BCCT is not able to refund for any cancellations after 5.00 pm on Monday 4th March. The first part sheds light on the functions and the most common practices of business research. It will discuss and exchange the main topics in business research and later focus on research on consumer behaviour. In most markets, customers are in charge and they have the market power. Companies sense, obey or die. In the second part of the seminar we will introduce how to design (more than one version of) a good questionnaire (primary data research), so participants will know the features and how to give feedback on questionnaires carried out by others, e.g. market research agencies. Characteristics of a good questionnaire. 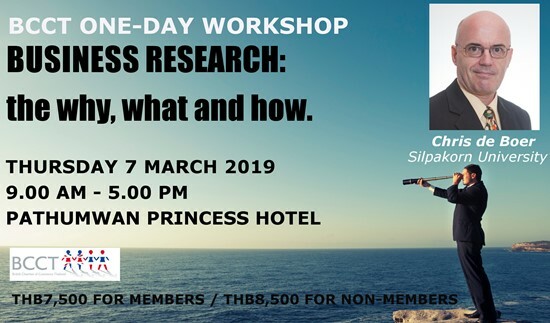 Chris de Boer is Corporate Research Consultant and currently lectures on strategic marketing and management subjects (like innovation) at Silpakorn University International College (Bangkok). He has 25 years experience in research in Europe, for different types of businesses (automotive, food and beverages, banking and insurance, detergents, health care products and tourism), as well as regional and national governments/institutes. He also undertakes different types of researches for academic journals and conferences (qualitative and quantitative, post/face-to-face/telephone, consumer and B2B).